Shree Siddhivinayak Temple is definitely one of the most revered and visited temples in India. Whoever visits Mumbai definitely nurses the wish to seek bappa’s blessing. 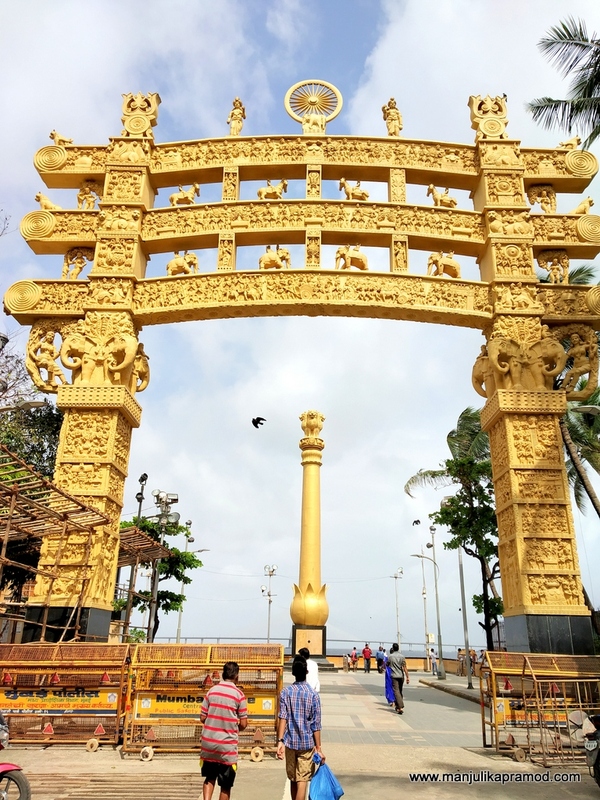 Since its one of the top attractions of the city, it also gets a huge footfall every day. No doubt, everybody cribs about its long queues but ends up going back to the temple again and again. The morning and late evening aarti periods are definitely one of the busiest hours of the day. But in the other hours, you might get it all in lesser time. If its your first visit, you might take some more time in figuring out where to keep your laptop bag or buy the modaks and flowers or where to wash your hands after putting your shoes in the rack. In the company of a local friend or guide, the visit definitely becomes much smoother. I still remember my first time in 2010 when it had taken almost 2 hours for the darshan. Thanks to my regular trips to Mumbai this year, I have had the opportunity to visit the temple four times already. And each time, I have been luckier with the darshan. Last Saturday, I visited the temple at around 9:30 in the morning and was pleasantly surprised to find myself walking directly towards the the innermost wooden sanctum of the temple where the idol of the deity thrives. There was hardly any rush. I couldn’t thank my stars more. 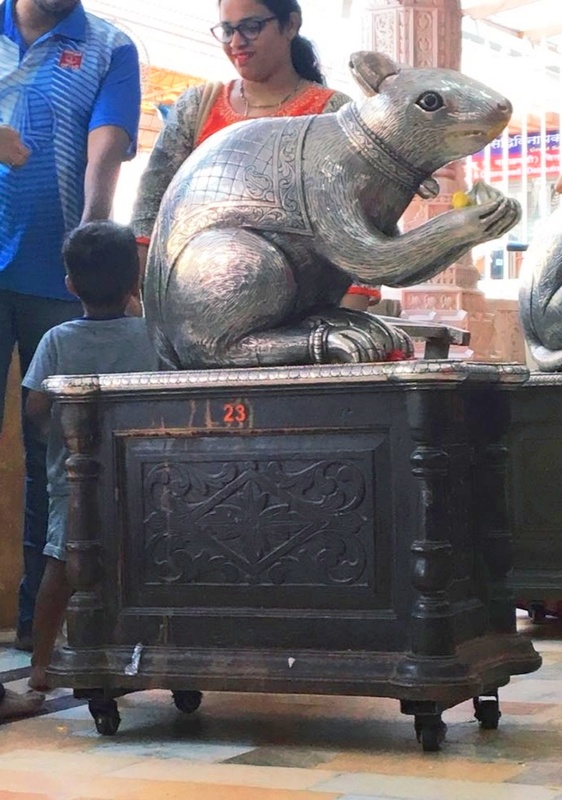 Siddhivinayak’s mouse – Don’t forget to say your wish in his ears. 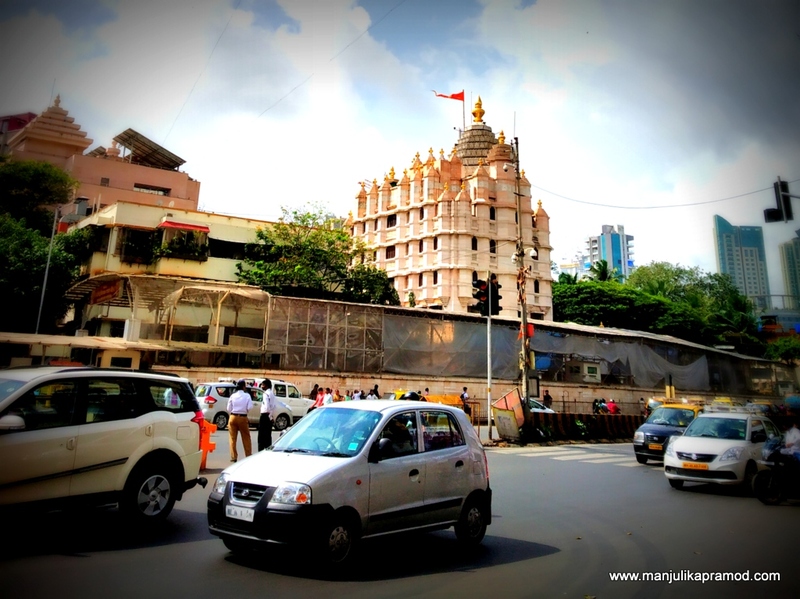 What is so special about SHREE SIDDHIVINAYAK TEMPLE? The visit to the city of Mumbai remains fairly incomplete without paying a visit to the temple of Shree Siddhivinayak and seeking blessings. 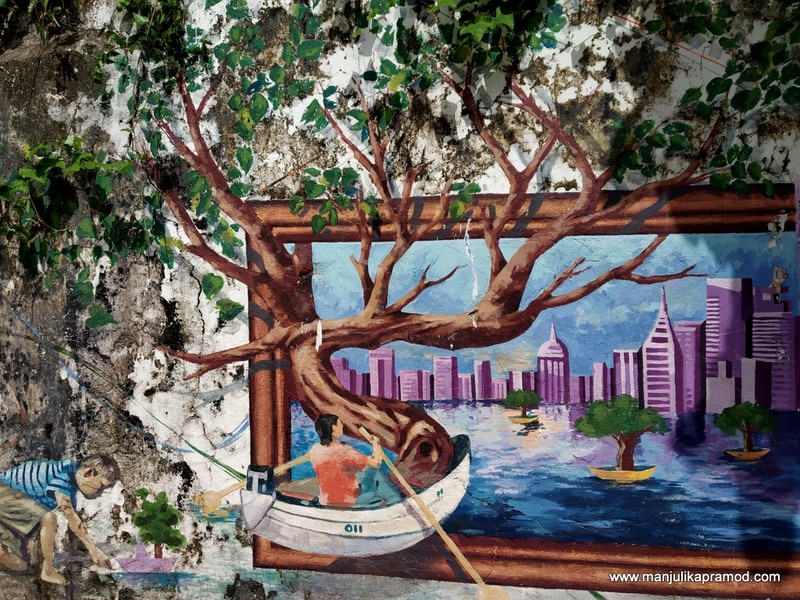 It is rooted as the most holy and sacred place in Mumbai. The name of the temple says it all. It houses one of the forms of Lord Ganesha, ‘who fulfills all wishes’. The idol is special because it has four hands (Chaturbhuj). The other most significant feature of the idol is that it is two and a half feet wide, made of single black stone. Also you must not fail to notice that the trunk of the deity tilts to the right. The forehead has a third eye which looks like that of Lord Shiv and Goddesses Ridhi and Siddhi can be seen sitting on the either sides. It was built by contractor Laxman Vithu and Deubai Patil on 19 November 1801. Deubai Patil wanted to open a temple, especially for the women who could not bear children and where they could come and pray. The intention was to give them a place where they could say their prayers to God without being mocked at and where there wishes could be granted. The story goes that this temple gave them children and granted a number of other wishes too. Over the years, the believe has strengthened as it has come to be known as divine. In the last 200 years, the temple has evolved from a small complex to a huge temple. It is one of the richest temples in India as it gets a lot of foreign donations. Since I was staying at Ghatkopar, I opted to take a taxi to travel to the temple in Prabhadevi. 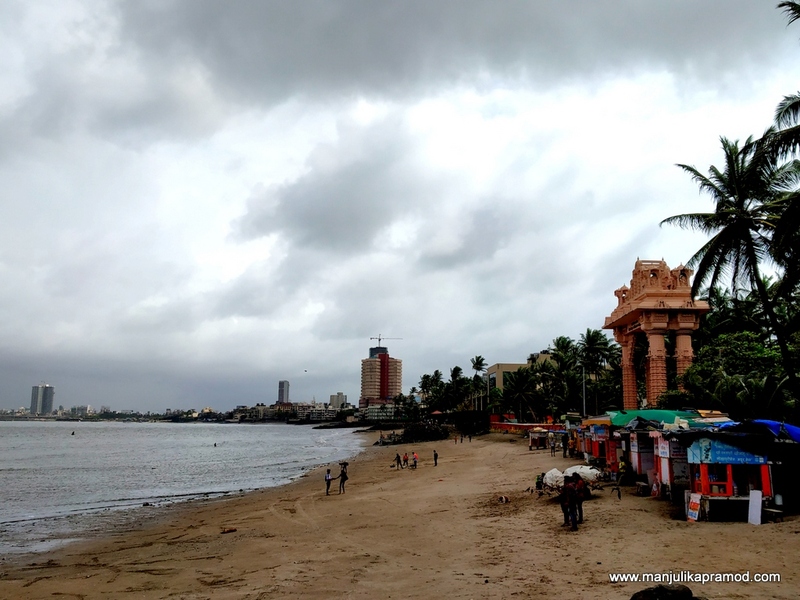 It is very close to Dadar Chowpatty and almost everyone knows it well. I hired a black-yellow taxi (Kaali peeli taxi). You may also use Uber or Ola to travel there. Kaali peeli will definitely be easier. No haggling is involved. The local autos don’t ply around that part of Mumbai. You just have to inform the driver that you wish to go to Shri Siddhivnayak temple and they will take you there. 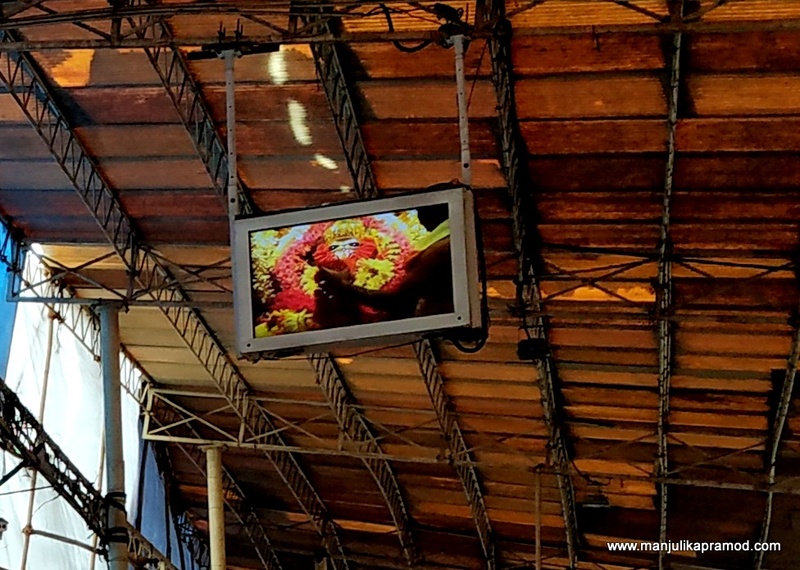 If you are well versed with Mumbai local, you may also come down to Elphinstone Road Railway Station or Dadar railway station. The temple is just 10 minutes away from the station. One must know that the temple is located in a crowded area and thus you must be prepared to handle chaos. Some bit of construction is also going around there and thus it adds to the woes these days. Despite of all the odds, the visit is worth it and the darshan is well managed. Once you are inside the temple, it just acts on your nerves. The Lord’s idol is very attractive. There are many kiosks selling flowers, garland, incense inside the temple. It is all well managed. 20 Things to remember when you are planning to visit the temple! 1.There is no entry fee for the temple. 2.Tuesdays, Thursdays, Saturday and Sunday are really busy days. So pick your days carefully. 3.The temple usually opens at 5 :30 a.m. and closes at 10:00 p.m. on all other days. On Tuesday, the timings are little extended (03:15 am to 12:30 am) as there is a Hanuman temple too in the premises. 4.If you have a laptop or a suitcase or a bag, just drop it at the locker which is on the right side of the entrance. There is a fee of Rs. 50. 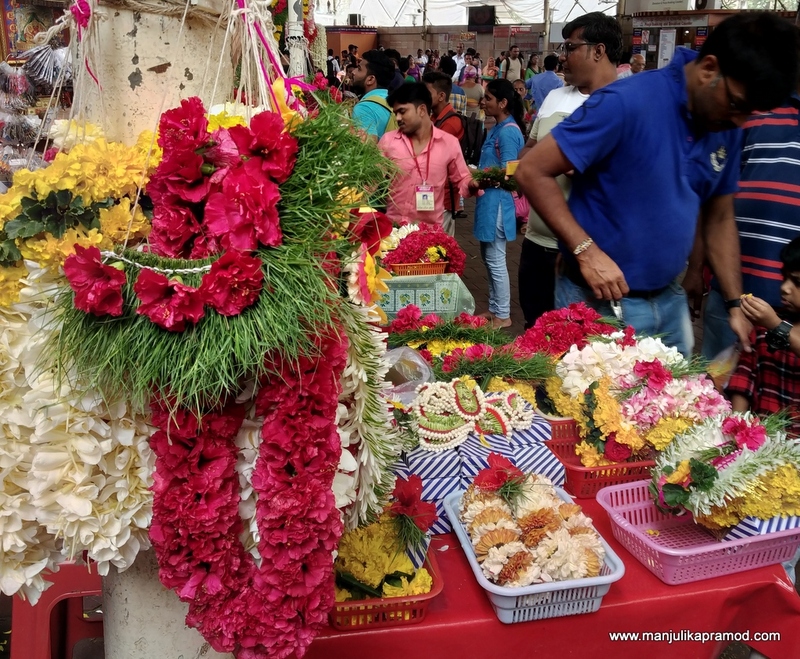 5.There are several kiosks from where you can purchase garlands, sweets, coconuts, incense sticks and flowers. 6.Walk in the temple and then buy modaks from the shop on the left hand side. Siddhivinayak sweets shop makes some amazing modaks. After your prayers, you can even sit and have breakfast, lunch or dinner in the restaurant. 7.I would say make your way through the security gate of the temple and then buy the essentials. 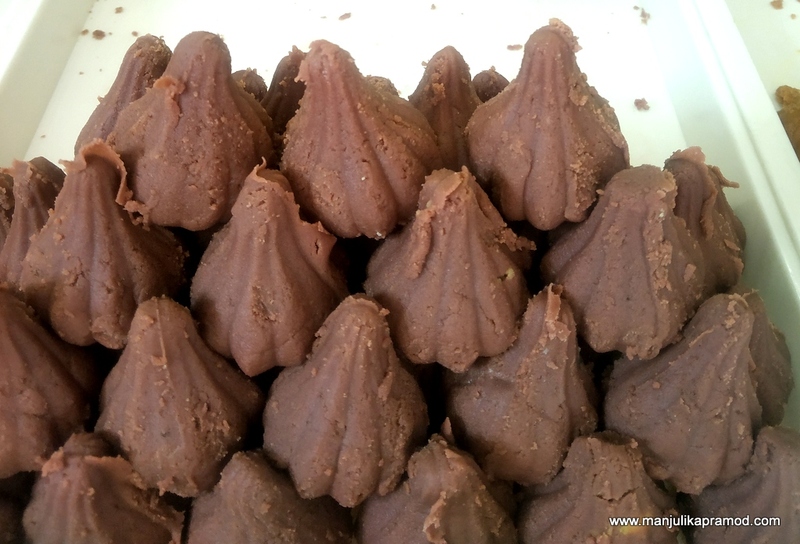 8.The most simplest way is to pick some ukadiche modak and some hibiscus flowers as offerings. 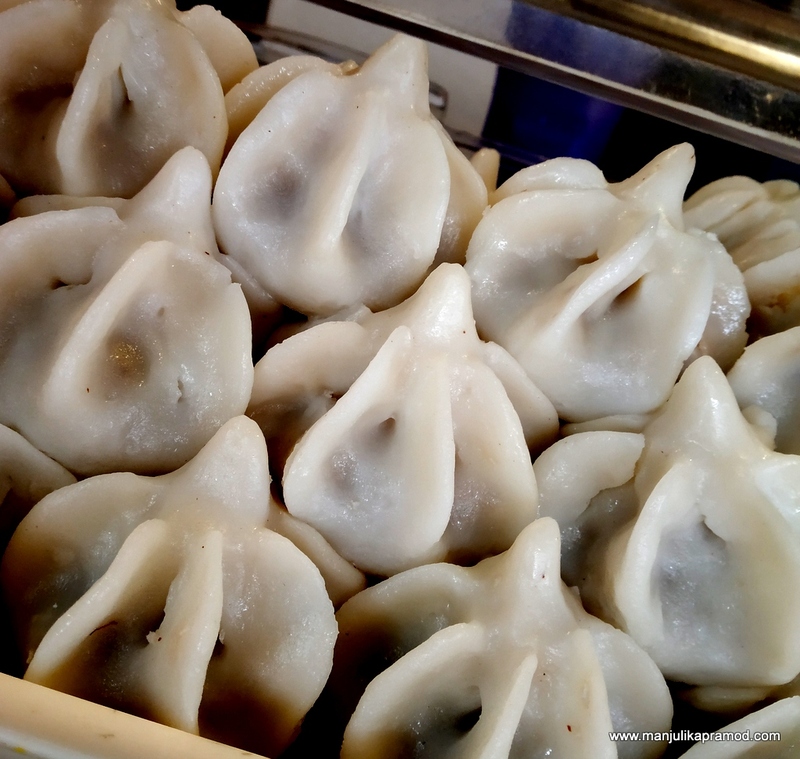 Ukadiche modak is one of the most popular modak variety made from rich dough and filled with coconut in the inside. 9.As you walk a few steps, you can drop your footwear at the designated counters. 10.Wash your hands at any of the flower or incense shops. 11.Then start walking towards the queue. Now there are two ways for the darshan. One is the VIP line where you can pay Rs. 50 and go for a shorter line. The other is a little longer. 12.I will suggest before going for the shorter way, always check the normal queue. On some of the days and timings, it is hardly crowded and you can easily get through in 15 minutes. 13.The crowd inside the main wooden sanctum is controlled by police. Hence they do not let people stand for long. The queue keeps moving. Despite being crowded, it is well managed. The security has to be strict to keep the miscreants in check. 14. Photography is not allowed. Don’t even give it a try. 15.The queue directs you to the idol of the Lord. After taking blessings from Shree Siddhivinayak, it is said that one must sit down in the temple for sometime. It is a very peaceful place and you will love to sit for hours. 16.Also look for the white board at one corner. Do right something with your third finger. They say wishes are granted here. 17.Next you may join the queue for the Hanuman temple which is in the same premises or head out. 18.Before exiting from the main area, look for Ganesha’s divine vehicle, the mouse or mooshikam. The ritual is that you must go near it, cover its left ear and say something in one of its ears. 19.I never forget to go around the temple and act accordingly. Somehow, I have a great connect with the temple and my wishes have been granted. So go for it without any doubt. 20.There is a VIP entry too for your old parents or aged people. I think its Rs. 500. After visiting the temple, I decided to walk around and learn about the nearby places. 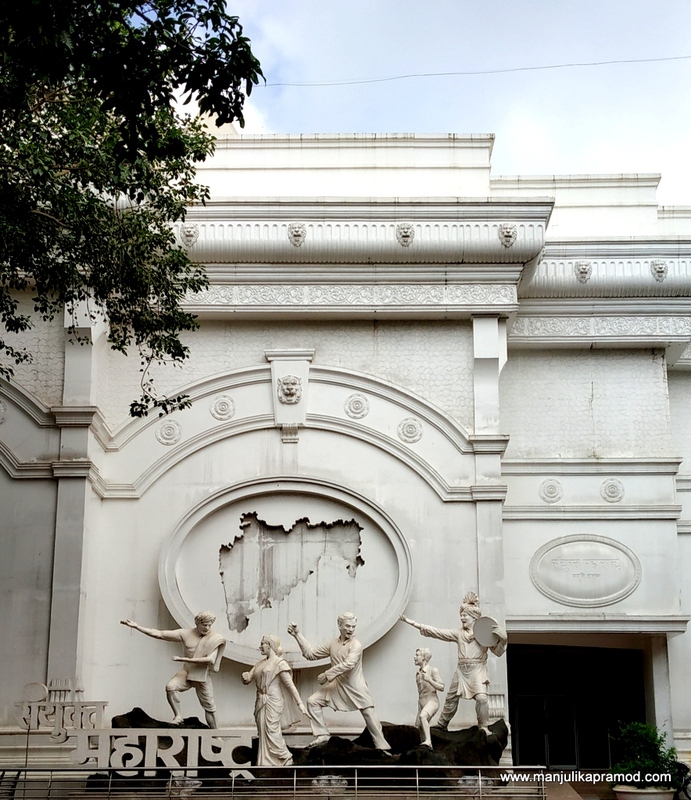 You may also visit the Dadar market, Shivaji Park, Shreeman Baalsaheb Thakre Smriti Sthal, Dadar chowpatty, Chaitya Bhoomi and check out some wall art too. 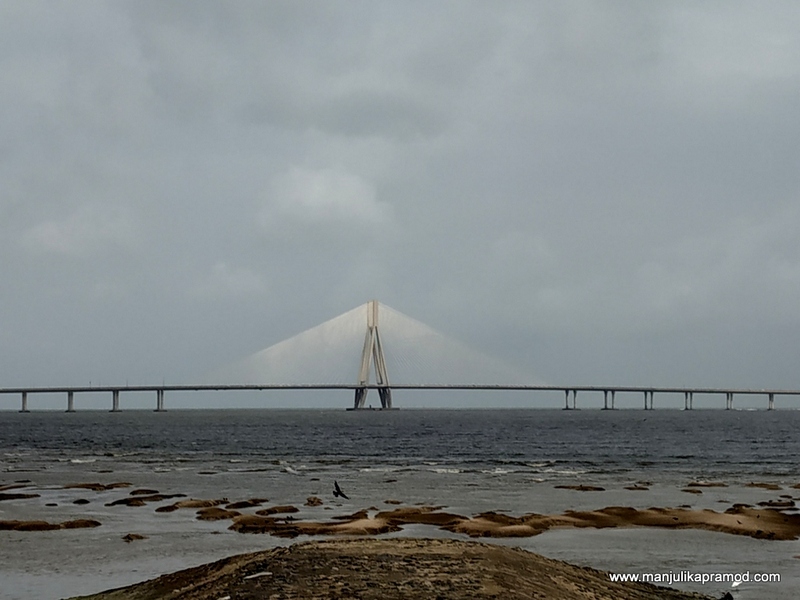 Some great views of the famous Bandra-Worli Sea link can be seen from the Dadar beach. After visiting the temple, I did a small walk for 2-3 kilometers and checked out all these places. Do share your experience if you have been there or after visiting the temple. Great post _()_ Beautiful pics.